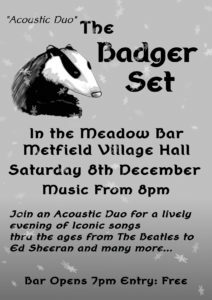 The popular local acoustic duo Badger Set are going to be rocking the Meadow Bar with their eclectic mix of top tunes from The Beatles to the present day. Yes, they even do Ed Sheeran, but don’t let that put you off. Catch them in the Meadow Bar at Metfield Village Hall from, the earlier than usual time of, 8pm on Saturday 8th December.